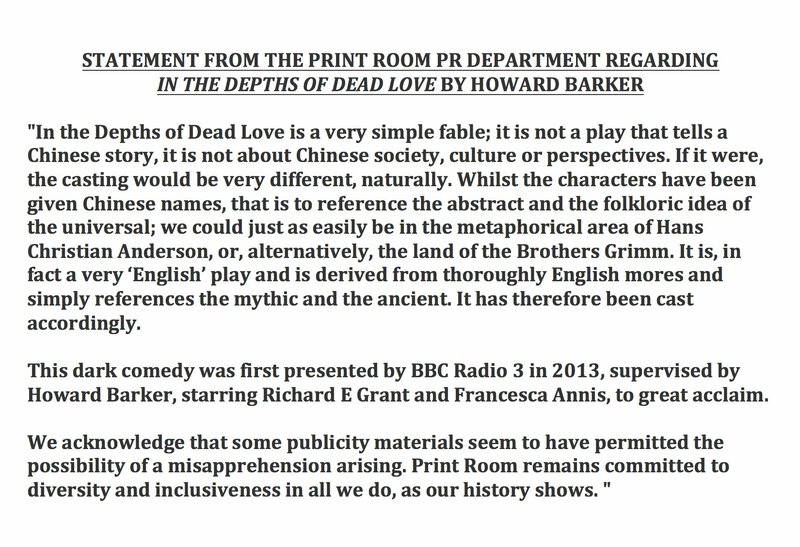 In the final weeks of 2016, we became aware that The Print Room at the Coronet would stage In The Depths of Dead Love by Howard Barker; a play set in ancient China with four Chinese named characters, with an all Caucasian cast. Papergang Theatre added its voice to the concern about this yellowface casting via our social media: we wondered whether the same casting decision would have been made had the play included Black characters. The practice of yellowface is not just about altering physical appearance but is the denial of a whole ethnic group in their own story, as explained in this Resonate article by Lucy Sheen. Firstly, we were disappointed the response implied that the English nature of the play would warrant an all white cast. Secondly, it deepened our concern that China and the Chinese were being exoticised or worse, denied as actual human beings. In the Depths of Dead Love is not a Chinese play and the characters are not Chinese. The production references a setting in Ancient China and the characters’ names are Chinese. These are literary allusions in Howard Barker’s fable and never intended to be taken literally. The allusions are intended to signify “not here, not now, not in any actual real ‘where’ ” and the production, set, costumes and dialogue follow this cue of ‘no place’. To use a real country and a real ethnicity to allude to the mythical and unreal, is salt in the wound of an often over-looked ethnic minority in the theatre world. BAME actors struggle for recognition: there is no level playing ground yet to justify this form of colour blind casting. We feel very strongly that The Print Room still has not understood the offence it causes and being silent about this would set a dangerous precedent for theatre of the future.Papergang Theatre welcomes the initiative of Andrew Keates to organise a peaceful protest outside The Print Room (map to be found here) on the 19th of January from 5pm -11pm. This event has been organised in collaboration with the Kensington and Chelsea Metropolitan Police. Those who wish to join are asked not to bring amplification equipment such as megaphones and sound systems, however they are encouraged to bring banners and placards to draw attention to the marginalisation of British East Asian artists. Papergang Theatre will join the protest on the 19th of January and we hope to see you there.